Hi friends! I hope you're having a great day! Brady had his Kindergarten orientation today and Dustin went with him while I stayed with Parker. I asked him which parent he wanted and he said "Daddy", of course. He did pretty well. Let's hope that tomorrow is the same! 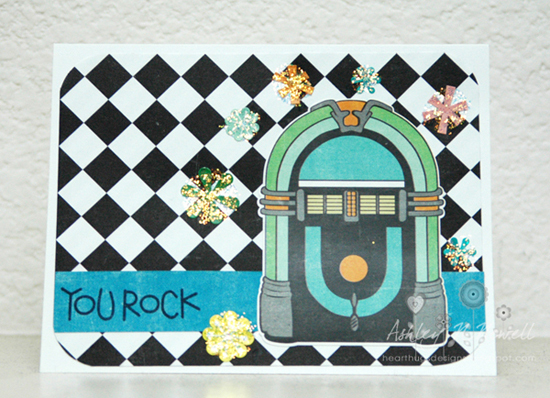 Today, I am sharing a card that I made for this week's Card Positioning Systems #278 sketch. I changed it up a little bit. I hope it's still recognizable. I used papers and stickers from Echo Park Happy Days. The stamp is from Paper Smooches. I added some Stickles because the stickers weren't standing out enough. I'm not in love with this card but I made it so I'm posting it and entering it in the challenge. ;) It's random anyhow.